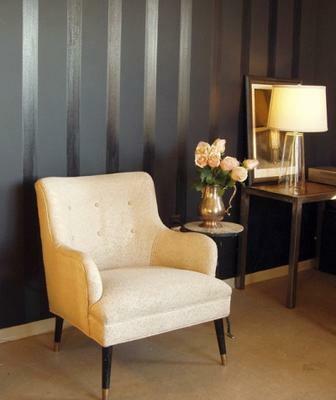 I am tempted to paint stripes on my bedroom walls, but I shudder when I think of all the taping I'll have to do! Is there an easier way to stripe a wall? As a matter of fact, there are several techniques available to you - see "How to Paint Stripes Without Taping" for a list of ideas. 1) Paint the walls in your desired color (a flat or matte finish is best for thi), and allow the paint to dry for a day. 2) With a plumb line or level, indicate the paths for the stripes with small pencil tick marks. 3) Get a very straight 2x4 piece of wood and hold the 4" side of the lumber against the wall, lining it up with the pencil marks. Using a mini roller and urethane (choose from satin, semi-gloss or gloss finishes), run the roller edge down the side of the 2x4, until a nice even coat of urethane is on the wall. 4) Remove the 2x4 and line it up on the other side of the just completed wet stripe. Once again using the mini roller, roll down the other side of the 2x4. 5) Continue until you finish striping the wall or the entire room. TIP: Use a sponge roller - other roller types my create jagged or fuzzy stripe lines/edges. But still don't worry if the lines don't come out razor-sharp or perfectly straight. This technique is not meant to be precise - that's why it uses a more forgiving product (urethane) rather than paint for striping the walls. You don't want to make a sloppy job of course, but there is some charm in the slight imperfection of this finish. Hmm, that's an interesting idea - using a 2x4. But I guess it would have to have a really smooth edge, and maybe not so good for contrasting colors?